Multiple monitors is the dream of any computer nerd worth her salt. You can play games at ridiculously wide resolutions, you can gain an impressive amount of screen real estate, and it makes your desk look like a NASA control centre. 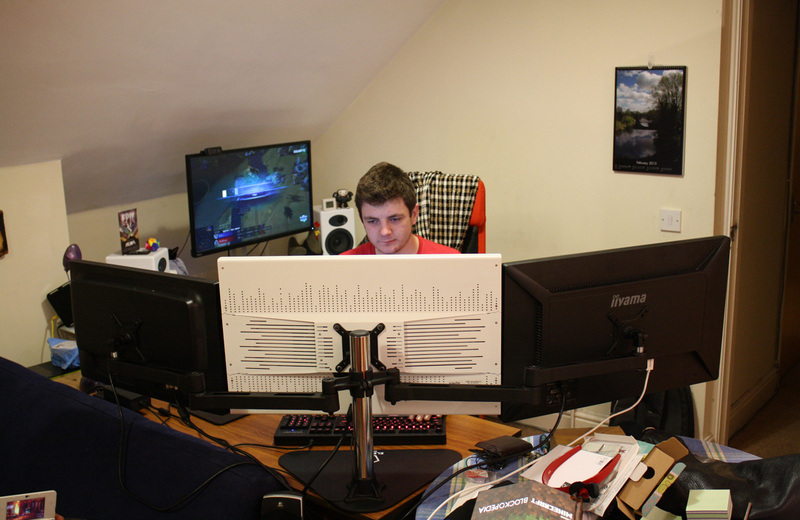 You could have your monitors just sitting next to each other on a desk, but the next level is to pick up a mount so that your monitors sit next to other in the air. It gives you more desk space, more options for adjustability and of course it looks way cooler too. This desk mount from Element Gaming promises to raise three monitors, each up to 28 inches, without demanding to be clamped onto your desk. Ebuyer were nice enough to send one over, so we’ll see how well it achieves that goal. Element Gaming promise that assembly is a five minute affair, so let’s get cracking! All of the components you’ll need come in a flat-packed box, so it’s a simple case of removing them all and placing them on a conveniently large work surface. 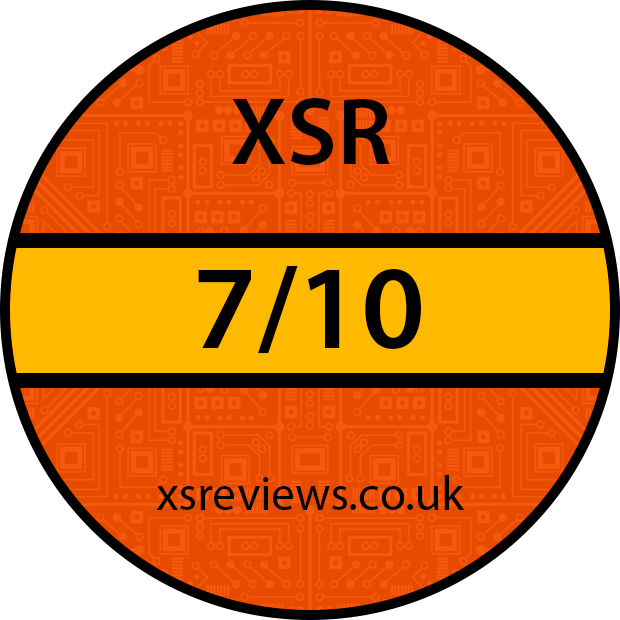 In addition to the components, you also get some seriously heavy-duty Allen (hex) keys in varying sizes so you don’t need to have your own tools. Following the printed instructions (and a rather helpful video), I assembled the mount in about 20 minutes. That’s a far cry from the five minutes that were promised, but still quite reasonable given that you’ll likely only need to build the unit one time. The biggest delays to the assembly were caused by the screw that locks the height of the mount on the pole. For whatever reason, screwing in the screw became incredibly difficult about two thirds of the way through, necessitating violent efforts to continue. Eventually though I got it through the rough spot, and it proved no concern on later assembly attempts. The base of the mount is a relatively thick, heavy steel triangle. On this formidable base, rests the aluminium column that holds the rest of the assembly. Each steel arm is made from two pieces, which can be freely moved from side to side. The arms can be moved up and down as a unit, but can’t be set independently. Each arm ends in a 100×100 VESA mount, which has a small amount of height adjustment via springs, and is fully rotatable to allow for portrait, landscape or mixed orientations. The centre mount can’t be moved from side to side, but can still be rotated. The entire unit is almost frighteningly solid, with a satisfying weight that ensures both a long life and stable positioning. The simple colour scheme – black steel, silver aluminium – should fade into the background, rather than attracting attention. I don’t own three identical monitors to test the Element Gaming Triple, so instead I loaded it up with the three monitors with 100×100 VESA mounts that I had lying around. That included a 27-inch Crossover monitor, a 27-inch iiyama monitor and a 24-inch iiyama. 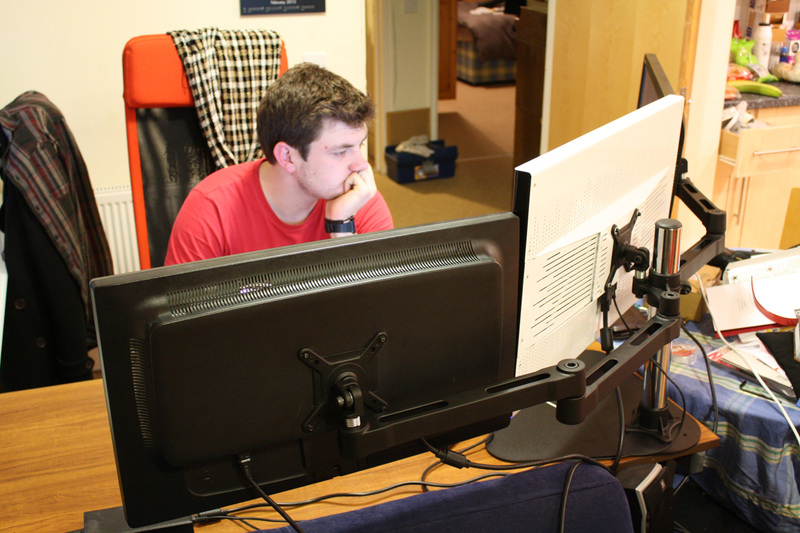 The difference in sizes was well-handled by the adjustable arms, allowing me to keep all three monitors touching. The weight of these monitors combined was substantial, but the solid materials allowed a surprisingly stable platform. Once installed, I set to making use of my new screen real estate. Gaming is the obvious choice here. You could use your central screen for gaming and the others for guides or secondary information; some games like Supreme Commander even allow you to throw part of the interface onto your secondary display. That’s all useful and good, but a more impressive (albeit less practical) use is to make all three of your screens into a single virtual display. AMD call this Eyefinity and Nvidia call it Nvidia Surround, but regardless of the terminology you’ll find that it’s pretty astounding. Three monitors is a much better configuration than two for this, as it ensures your centre point (e.g. your crosshair or the track in front of you) is on a single screen, rather than split between two screens as you’d get on a naive dual-screen setup. Getting all of the monitors in position revealed some flaws in the design. Firstly, actually loading the monitor is quite an operation (if you’re using monitors towards the bigger end of the scale). We had to mount them face down, then move the assembly onto the stand all at once. Adjusting the monitors afterwards is also a bit difficult, compared to a free-floating mount – you can’t just push the monitor where you want it, you have to go behind and tug on the arms instead. It also uses a fair bit more desk space than a clamp mount, although the flat base at least ensures you can put stuff on top of it. The Element Gaming Triple Desk Mount delivers on the majority of its promises. Although assembly took a little longer than five minutes, it was still easy to construct thanks to a sensible design and good documentation. Once built, the high quality materials used in its construction ensured a stable platform for the three monitors we tried it with. 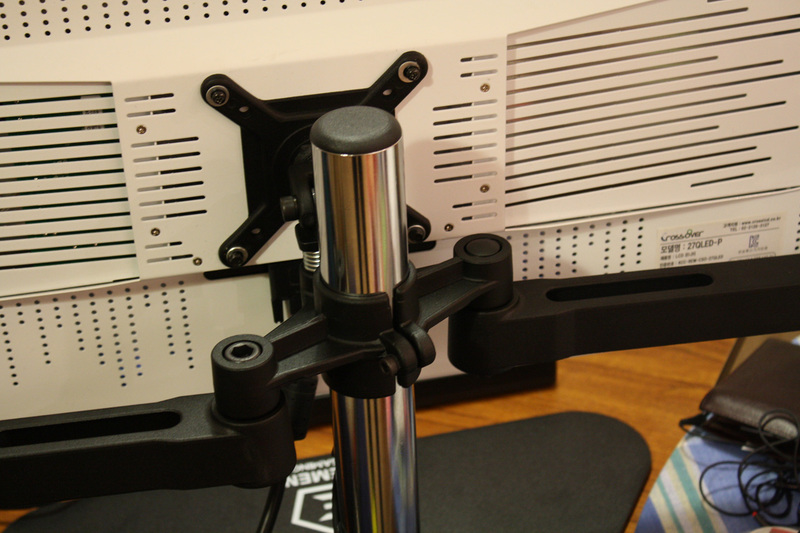 Adjustability wasn’t quite as good as with some clamp mounts we’ve used, but was still sufficient to make use of mixed-size and mixed-orientation monitors possible. While the mount has a high asking price, it makes a hell of a finisher for your three monitor setup.